ScoreHero :: View topic - 7/3 DLC: Yacht Rock Pack 01! 7/3 DLC: Yacht Rock Pack 01! Posted: Thu Jul 05, 2018 4:08 pm Post subject: 7/3 DLC: Yacht Rock Pack 01! Throw on your captains hat and get ready to set sail with Rock Band on our inaugural voyage into a boundless sea of smooth. Yes of course were talking about Yacht Rock. Welcome aboard. 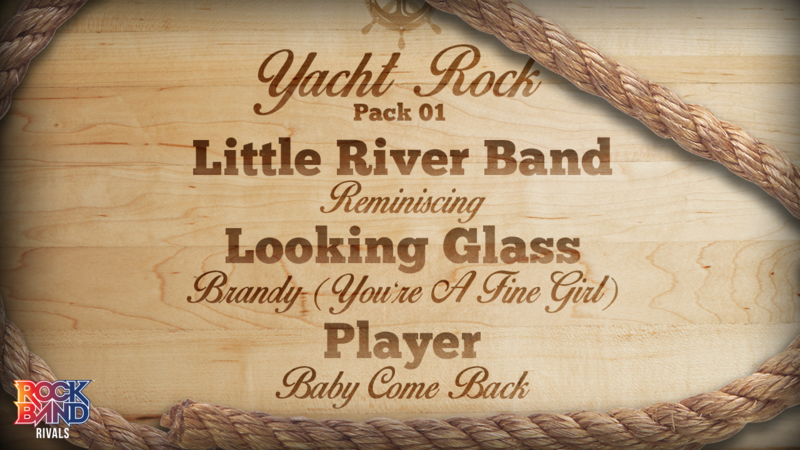 Were proud to introduce our first official collection of Yacht Rock songs to the Rock Band DLC catalog with this pack. The Yacht Rock category is not without its controversy with many a heated internet debate around what is or is not considered Yacht Rock. While many of the criteria are subjective one point of consistency reigns: Yacht Rock songs are all silky smooth. These three are no exception. Take Little River Bands 70s staple Reminiscing. One of Australias finest musical exports this easy listening hit received a Five Million-Air award from BMI marking it as the most-played song from an Australian act on US radio. Youll find an easy-going bassline here placed under some tough harmonies (a recurring trend this week to be sure). Guitarists can look forward to multiple solos including one of the classiest trumpet solos in music. Head out to sea on your Earth-based ship with Brandy (Youre A Fine Girl) from Looking Glass. The song came from Looking Glass self-titled album and proved to be an instant hit becoming the most popular record in the DC area before it even hit shelves thanks to its early debut on WPGC DCs biggest radio station at the time. Its even caught some wind in its sails in recent years thanks to an out-of-this world film placement. Harmonies are a highlight here so get some friends and belt them out. Drums will hop over to the hand percussion in the bridge to fit the mood. This #1 hit is all youll need out at sea but weve got a whole Pack. Player rounds things out with Baby Come Back the first single off their self-titled debut album. Arguably the saddest song in the Pack from a story perspective it stays emotionally light as yacht rock asks. The groove of the song and the relatable subject material took it to #1 on the Billboard Hot 100 when it released. Were gonna say it a third time this song has great harmonies so make sure you have plenty of USB ports at sea for all these mics. The guitar starts on the lead during the intro and hops over to the harmony part when it enters shifting the chart a bit while keeping your focus on the main attraction.